I love avoiding homework. Really, I do. Sure, once I hunker down and get into the groove of it, I’m cool. Until then, I’m like a child being put to bed early. I kick and scream and hold on to the door molding with my tiny fingers until one of my parents pries me off and stuffs me under my bed sheets. Thank god I don’t live with my parents anymore, no supervision rocks. Until its 2 a.m. and I still have 6 hours of homework and only 3 1/2 hours of energy. Then I wish I had my mother breathing down my neck. Last night was one of those nights. I spent the day procrastinating. Matt and I made the brunch of champions: thick cut bacon, fried eggs, and southwestern hash browns and a big cup o’ joe – all in my new cast iron skillets. Which are AMAZING. Then I looked up how to clean my cast iron, since as some of you may know, you can’t use soap. So I exfoliated my skillet with salt, put it back on the stove to dry, then conditioned it with a wee bit of vegetable oil to keep it lookin’ smooth. OH BABY! After that, I bleached my sink, and used 409 to wipe down the counters. And the stove. And the kitchen walls. Then I used some furniture stain to give my new wooden trunk a glossy finish. This took a while, cause the trunk is huge and I was using quite a bit of elbow grease. I had just sat down to start my homework when I realized that I needed to start baking some ridiculously extravagant cupcakes for Julio and Sohini’s birthday party! Because after all, my reputation as my friend’s “go-to girl for ridiculously extravagant food” comes above all else. My Editing homework could wait. See, Julio’s birthday is on Friday and Sohini’s is on Sunday, so we are having a “Hobo Party” on Saturday. You know, where we all dress up in our homeless best i.e. ripped tights, plaid shirts, Doc Martens, and fur caps and sit out on Sohini’s back porch around a fire pit eating hot wings and gumbo, amongst other tasty treats Matt and I will be whipping up. I knew we had to end the night off well – with a food coma, justifying the fact that we are going to turn this shin dig into a massive sleepover (I already called dibs on the couch). Cause really who wants to move after 5 courses and copious amount of booze? 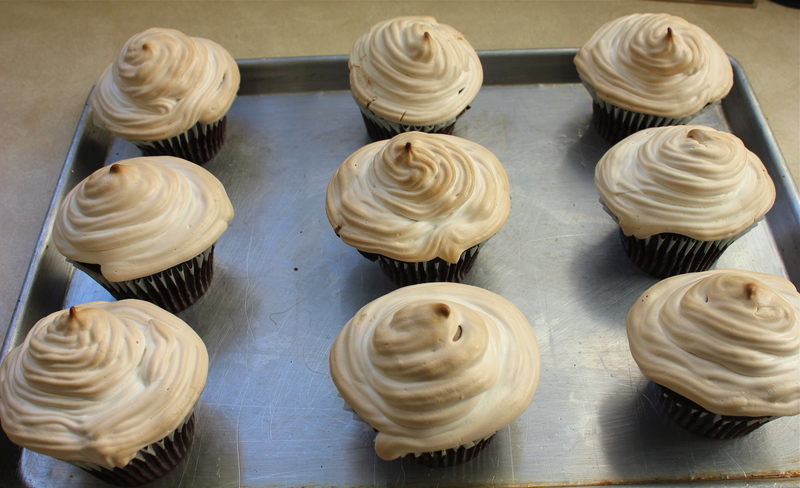 Thus my adventure to make Chocolate Cupcakes filled with Peanut Butter Chocolate Chip Cookie Dough topped with Toasted Marshmallow Meringue Frosting began. Or, as I like to call them, Heart Transplant Cupcakes. 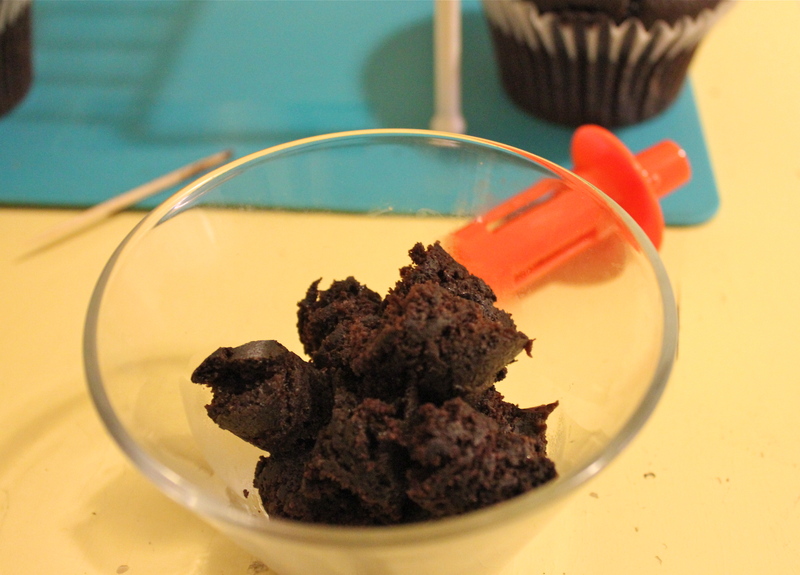 A double entendre of sorts, because you take out the center “heart” of the chocolate cupcake and replace it with a new cookie dough “heart.” Also, because you will probably need a new heart yourself after too many of these. Especially when you accidentally buy Jumbo cupcake liners, instead of the regular ones. Either way, like I said, ridiculous. 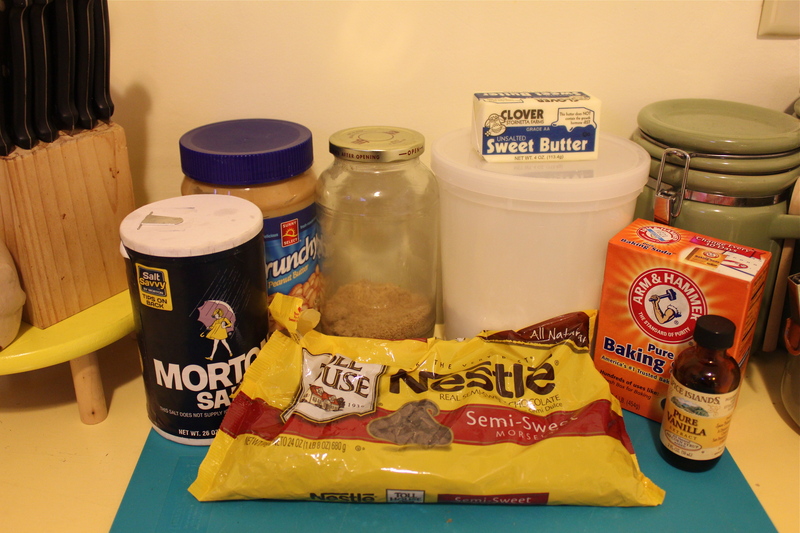 I started by setting up all the ingredients I would need for the chocolate cupcakes (so I could take this adorable picture). I preheated my freshly cleaned oven to 350 degrees before I got to work. 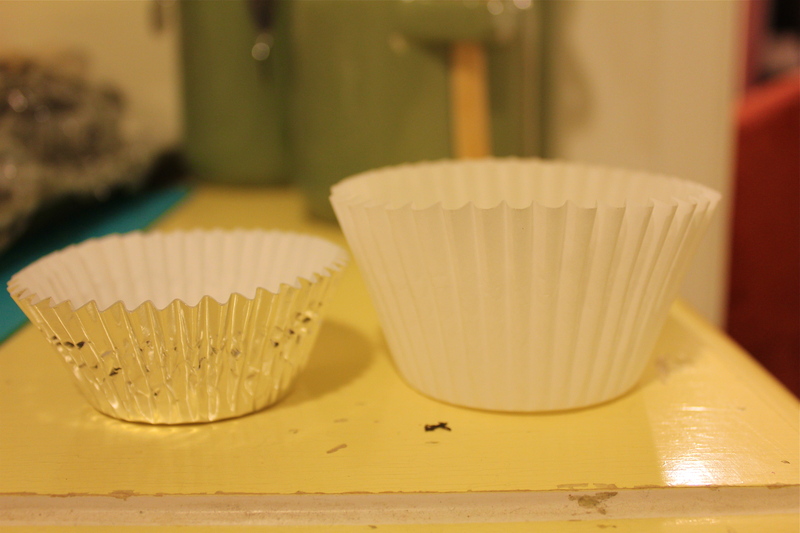 Now, because I bought those jumbo liners, I only needed to make 12 cupcakes. 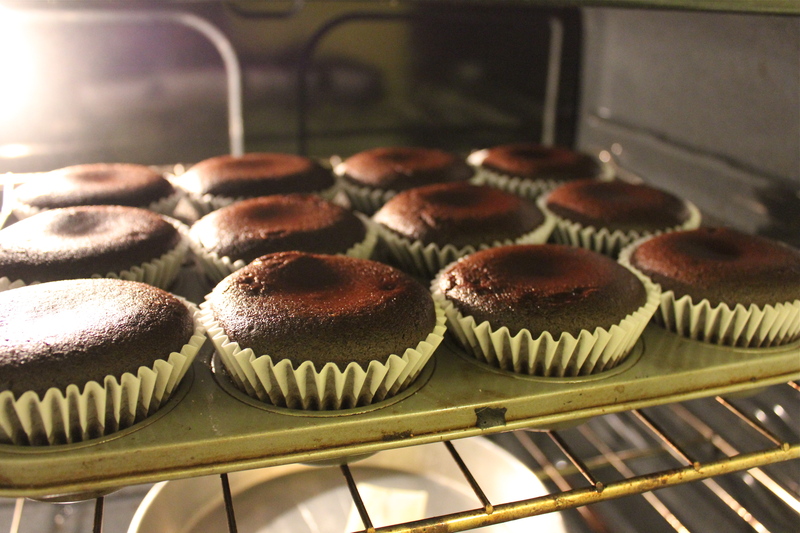 For regular cuppy cakes though, line 2 trays for a total of 24. 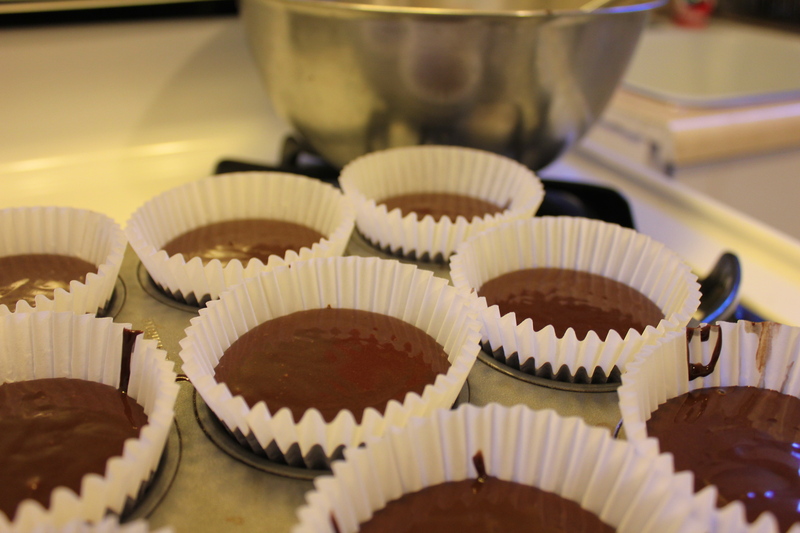 The batter is gonna be runny, but that’s OK.
Pour the batter into the lined trays and bake for 30-34 minutes for the jumbo cups, but only 20-24 for regular sized. 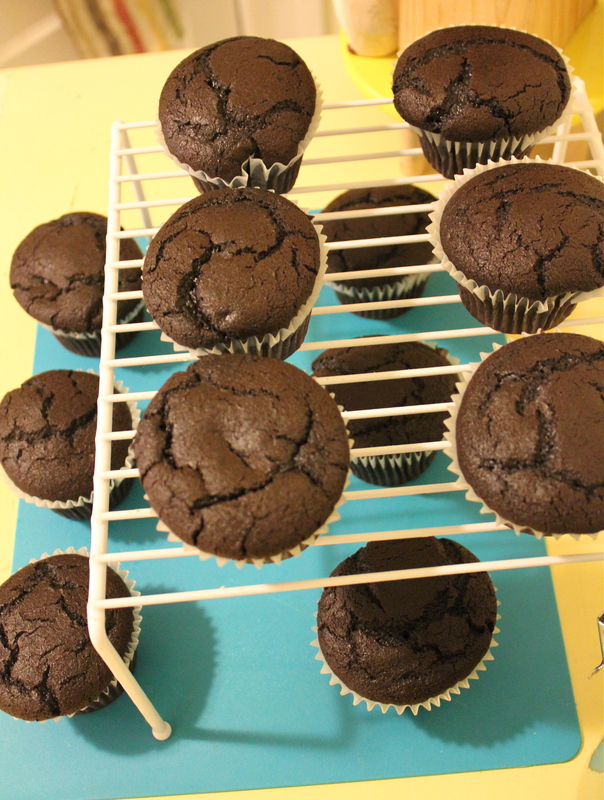 I found that 31 minutes resulted in the perfect cupcakes; they passed the toothpick insertion test with flying colors and remained moist even after cooling down. So perhaps, 21 minutes would be the sweet spot for the regular version. Don’t forget to peak at those beauties while their still in the oven! 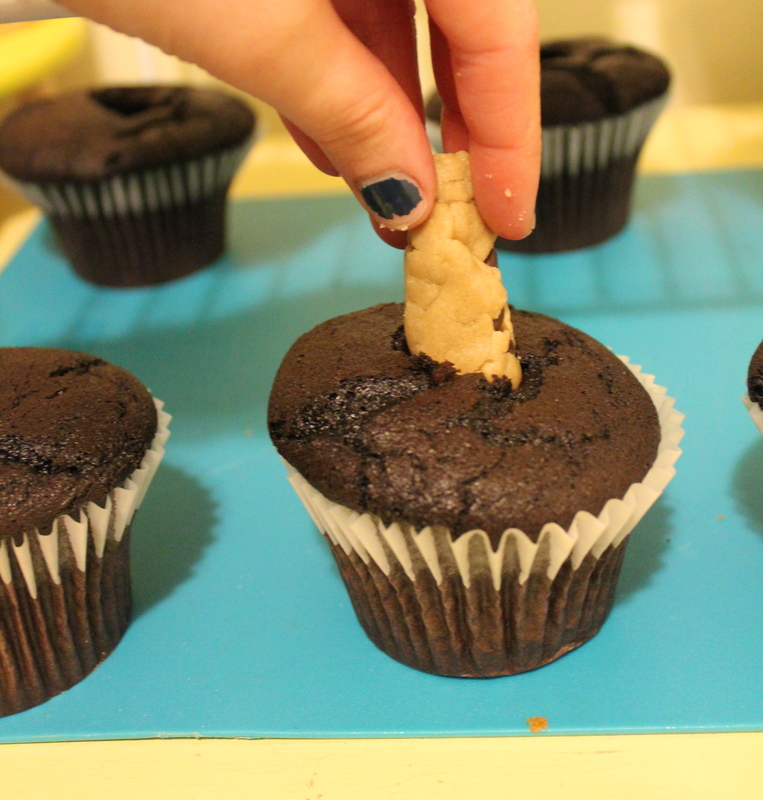 Let these chubby cupcakes rest for at least 10 minutes before you put the cookie dough ball on top. While that’s happening, get started on those Cookies! 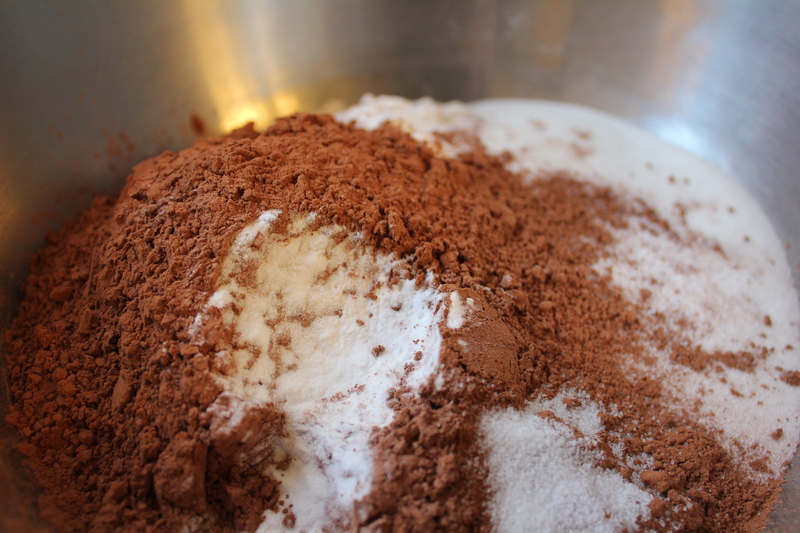 Cream the sugar and butter in a large bowl with an electric mixer, or a really strong arm, until fluffy before you add the peanut butter and vanilla. 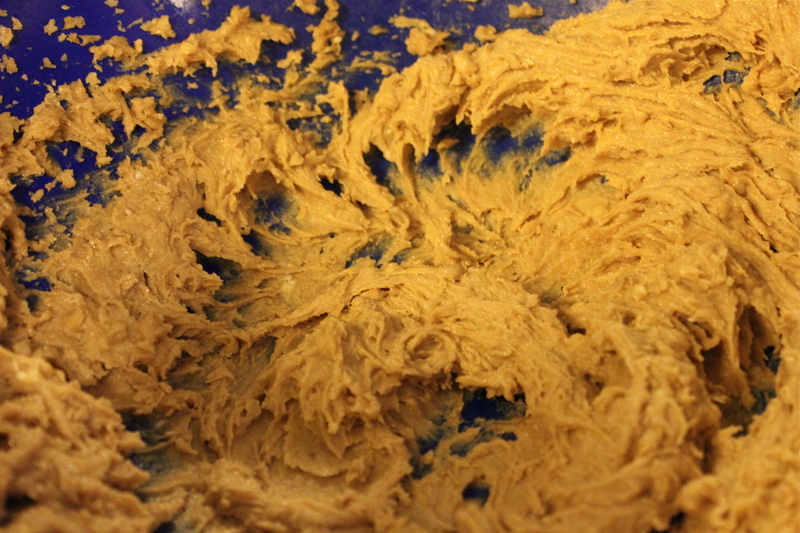 In another bowl, whisk up the dry ingredients and then fold them into your sticky peanut-buttery batter. 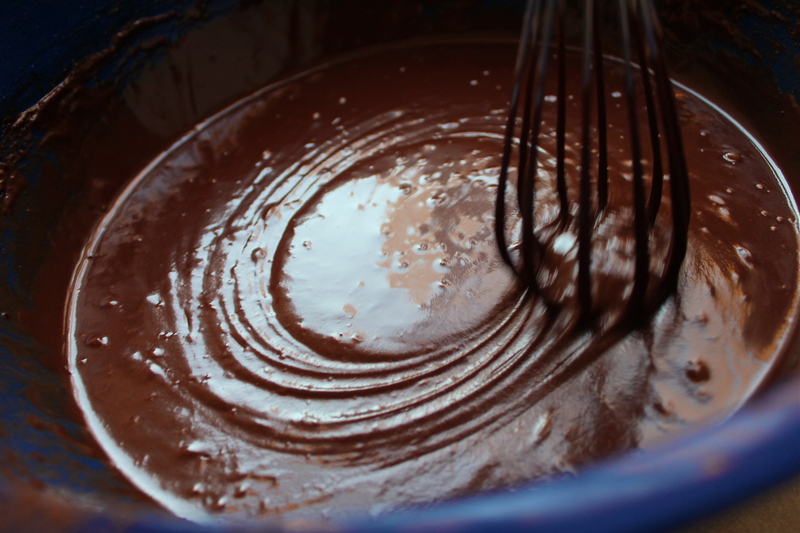 Then add your chocolate chips! Roll yourself some precious little balls of dough to top your cupcakes. The faint of heart can just stop right here. 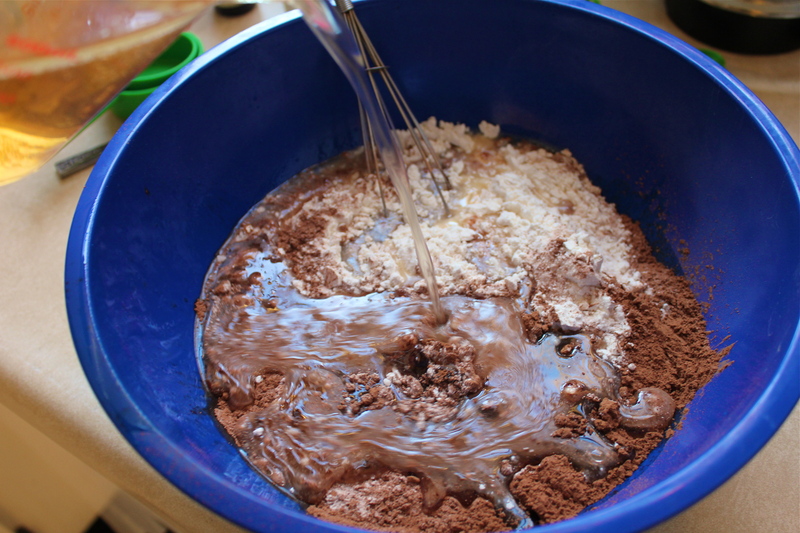 It was at this point that I got a brilliant idea, see I had all this extra cookie batter since the original recipe called for 24 cupcakes, the cookie batter was measured out to match that. But…I only made 12 cupcakes. 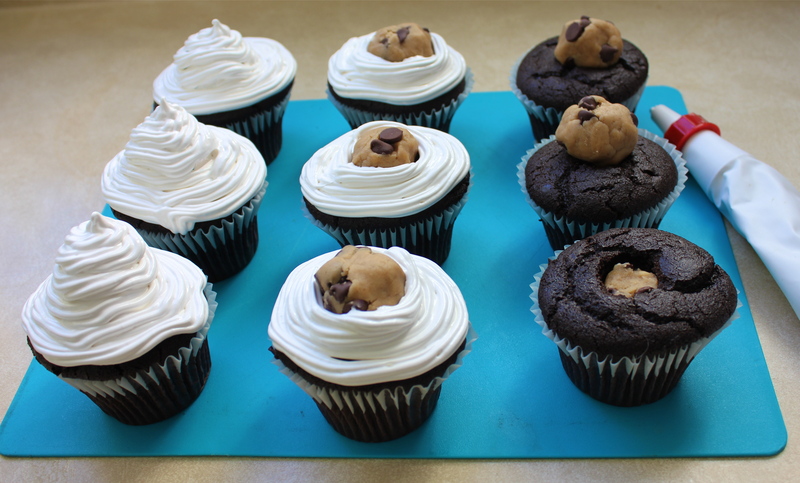 I gouged out those cupcakes tender insides and filled it with cookie dough! OH THE GLORY! THE SHEER BRILLIANCE! See I took this nifty little tool my mom gave me to pop the insides out! She got me this tool for my birthday, you’re actually supposed to use it to core tomatoes. But hey, tomatoes and cupcakes aren’t THAT different. 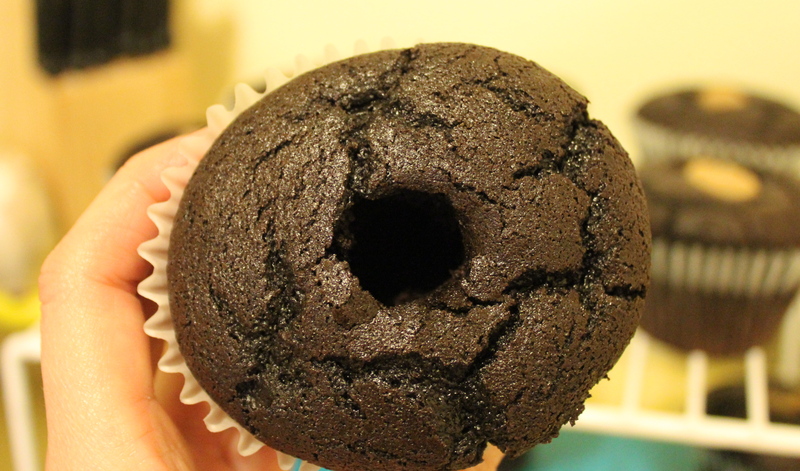 Here you have it folks, the “heart” of the cupcakes. Any reasonable person would smush them all into one big cupcake heart ball and then shove it in their mouth. But I was generous and shared them with my new roomie, Lucy! 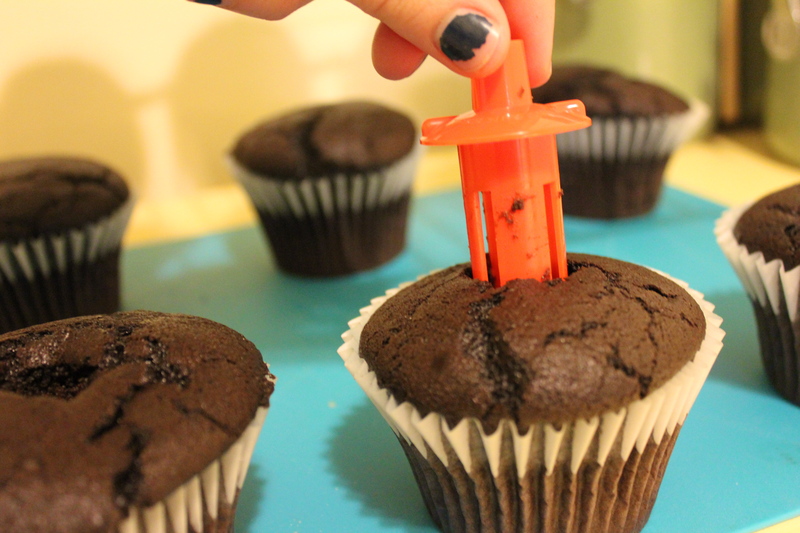 If you are gonna perform this surgery on your cupcakes, you gotta do it quick! (Please excuse my chipped nails) Give these babies a new cookie heart that will fit in to where their old one once was. After you have squished an appropriate amount of dough INSIDE the cupcake, now you can smash the perfect little ball of dough on TOP of the cupcakes! Like a beautiful chocolate chip hat! 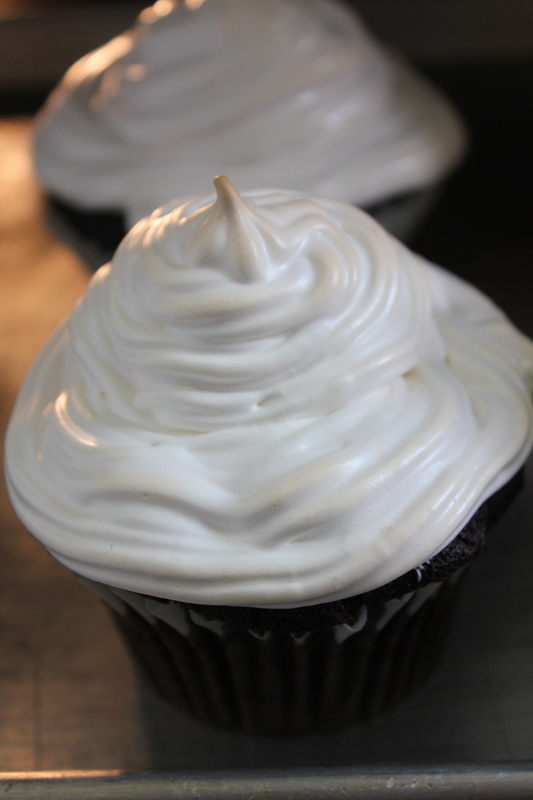 Now for that glorious-perfect-fluffy-delicious frosting! Take a medium sized saucepan, fill it with about 2 inches of water and then set it to simmer on the stove. 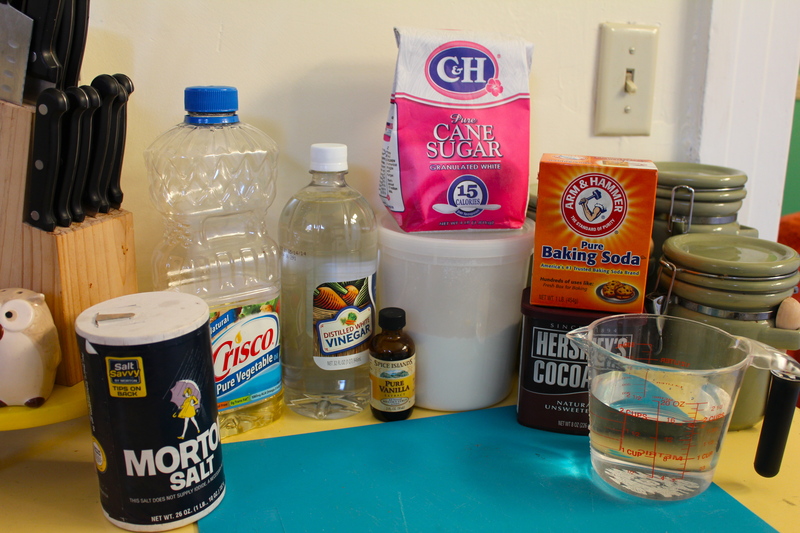 Then add in the sugar, the corn syrup, and the salt in a heat proof bowl and place it over the simmering water. 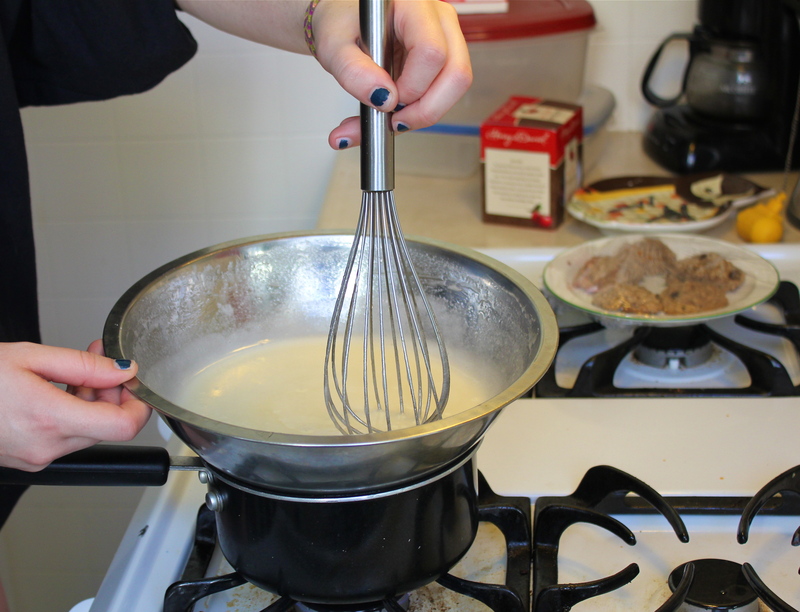 Whisk the mixture together for about 5 minutes on the stove until the sugar dissolves, but not so long that the egg starts to cook. 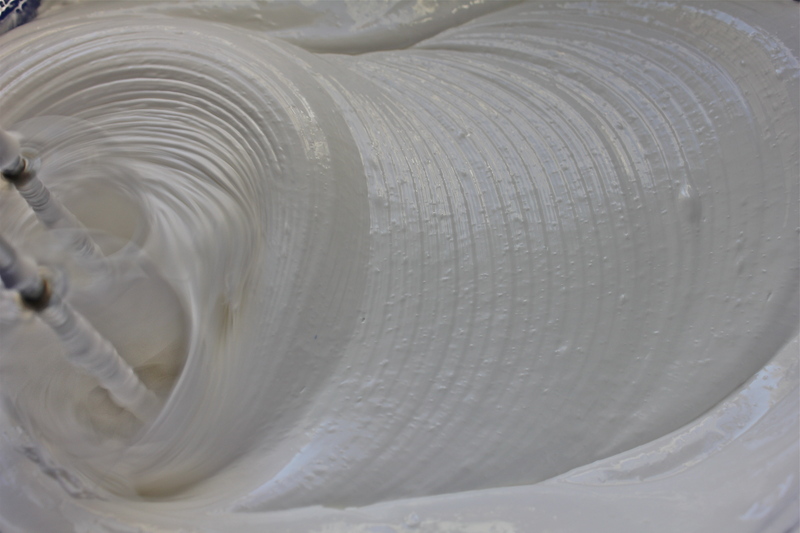 Then start mixing it with an electric mixer, unless you have a bionic hand that can whisk at lighting fast speed to turn this eggie mixture into meringue. 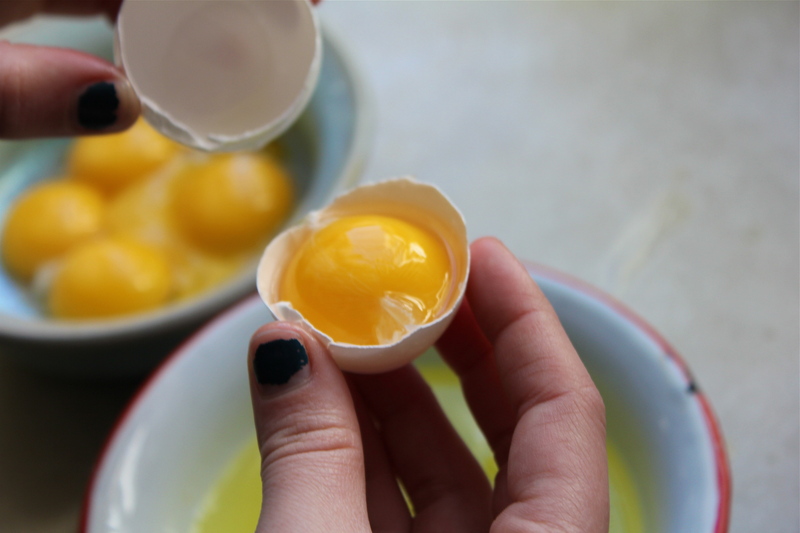 Do this for about 8 minutes, until stiff peaks start forming. 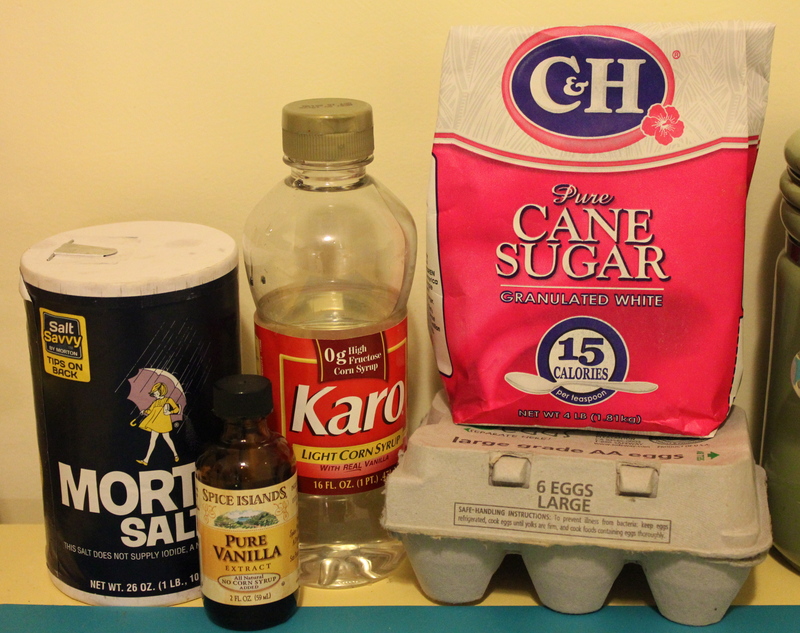 Now you can start frosting! I used a medium sized star tip on my frosting bag. But if you don’t have either of those, using a ziploc bag with a VERY modest amount of one corner cut off would work fine too. Aren’t they growing (up) so fast?! Once they’re all dressed, the real fun begins! 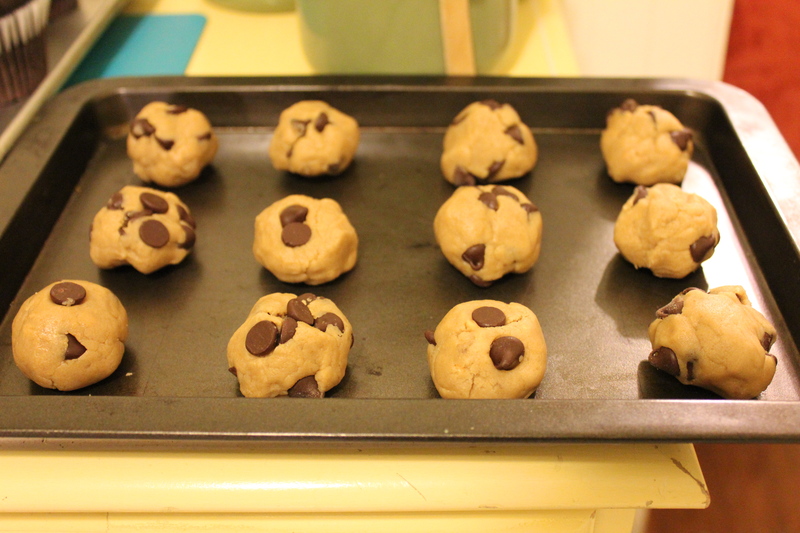 Put then under the broiler for about 2 minutes, depending on the heat of your oven…mine took about 4 minutes. Watch them like a hawk. Seriously, don’t walk away. Or start doing the dishes. Or licking the frosting bowl. Just kneel in front of the oven and watch. I personally like my marshmallows a little burned, so I made these the same way. No matter your preference, PERFECTION IS A TOASTED CUPCAKE. See, THIS is worth kneeling in front of the oven. The frosting got all crispy like a great toasted marshmallow should. 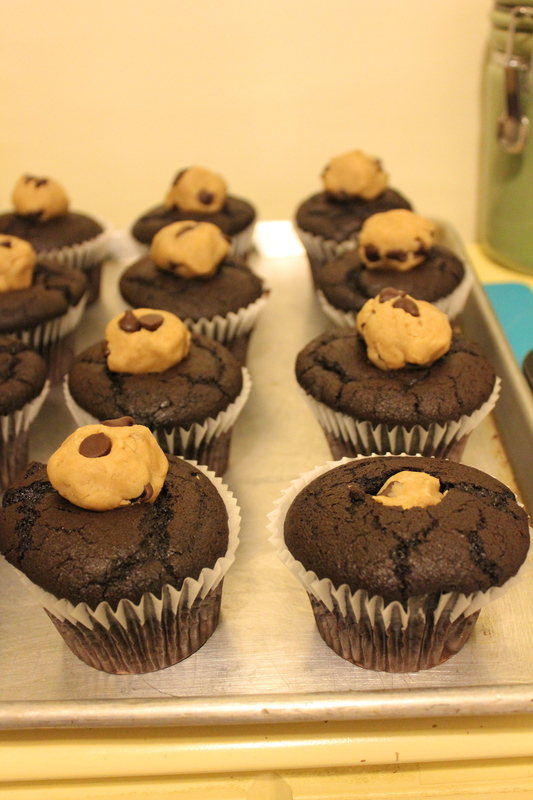 The cookie dough inside was a little soft, but still doughy and uncooked (my favorite way to eat cookies anyway) and the cupcakes – dang. So moist! 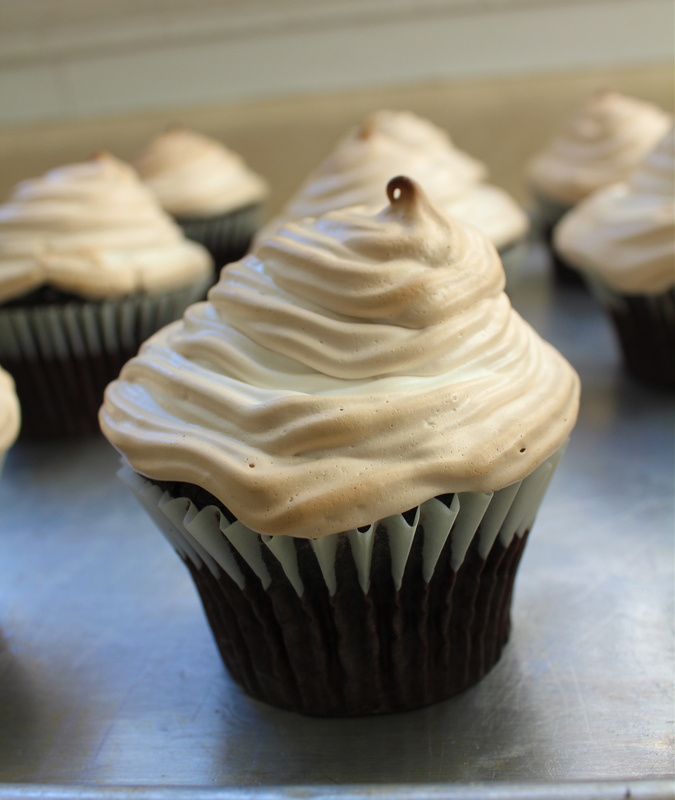 These are a must make at the end of a long day kinda cupcake. They are also the cupcake you wanna eat for breakfast. And the kind that your friends will bug you to make for every birthday, get together, and “hey, wanna make those cupcakes and come over” event. Pretty much, these cupcakes are life altering – and heart stopping. This entry was posted in Uncategorized and tagged Birthday, chocolate, Chocolate Chip, Cookie, Cookie Dough, Cupcake, dessert, Extravagent, Frosting, Fun, Indulgent, Marshmallow, Meringue, Peanut Butter, Smores, Toasted by kristinakerley. Bookmark the permalink. I’M SO WET RIGHT NOW! I love you and can’t wait to go down on these.